Due to the fact the last Citrine Wagtail (Motacilla citreola) in North America only put in a very brief appearance, I am sure the first-winter bird in the Comox Valley of British Columbia is looking pretty tempting to some ABA listers! I am fortunate enough to live on southern Vancouver Island, so it was no skin off my back to hightail it north up the Island Highway and be at the wagtail site around three hours later last Sunday. A slim fraction of birders that want to see this bird have that option, so I thought I would highlight some options for those contemplating a wagtail chase. The wagtail has been putting in regular appearances for several weeks straight now and only recently has there been an exciting change occurring to the bird itself. In the last few weeks, the wagtail has been molting some feathers on its face. Recent photos by Tony Markle (seen here) are some of the finest I've seen yet and they show the hints of lemon around the eye coming in. If you are making an attempt to see the Citrine Wagtail and strike out at the traditional location, visit Nathan Hentze's blog entry for an alternate location the bird was seen during a bout of stubbornness in the last days of 2012. The sighting continues to amaze me and the fact that so many observers have been able to come out and see it is great! Hopefully this bird continues to delight birders from all over the ABA area that make the trip out! If it's still there when I get back from Ontario in the second week of January, I hope to make another trip up to see it in all its yellow splendour! Check to see what the most convenient, comfortable, and cost-effective means of travel is for you. The quickest route would obviously be catching a flight right into Comox, as the airport is just over 10 minutes from the wagtail's location. For reference, the two airlines that have service to the Comox Valley Airport are WestJet and Central Mountain Air. This can still be tricky to arrange as WestJet only has flights in from Calgary and Edmonton, while Central Mountain Air flies in from those two cities plus Vancouver. Check their websites for scheduling and availability. The Nanaimo Airport offers the next most reasonable option as it puts you around an 1.5 hours away and has slightly more options than the Comox Valley Airport. The biggest airport on Vancouver Island is the Victoria International Airport, which has many flight options so check your favourite airline to see if they have available flights. The downside to the latter airport is the 3 hour drive you'd need to make after flying in. The two ferries to Nanaimo are operated by BC Ferries and you should know the schedule before arriving at the terminal, and also show up a bit early to ensure you make it on. For best results, you will want the first ferry - so that's 6:30 a.m. for the Horseshoe Bay to Departure Bay Ferry and 5:15 a.m. for the Tsawwassen to Duke Point Ferry. The Coho Ferry is run by the Black Ball Ferry Lines and is does not run as often. The first ferry leaves at 8:20 a.m. and puts you in Victoria just before 10:00 a.m., so you wouldn't make it up to the wagtail site until around 1:30 p.m. if all goes well. For each of the directions provided in the Google maps above, you can see that the end point is approximately 500 metres (or 1/3 of a mile to Imperial-based readers) down Comox Rd. after taking a right turn off 17th St. after crossing the Courtenay River. Once on Comox Rd., just drive a short ways and look for a roadside pullout along a chainlink fence on the right side and there should be room to park there. John Puschock was kind enough to post a photo of the gravel road you head down to look for the wagtail. Note the "For Sale" sign - it's a good marker to know you're in the right spot if there isn't a line-up of cars. Please be careful crossing the road as it can be busy with traffic at times. As you walk down the gravel road, you will come to a cable gate and there will be some trees on your left. Step over this gate and continue past the small patch of trees until you reach the opening on your left. 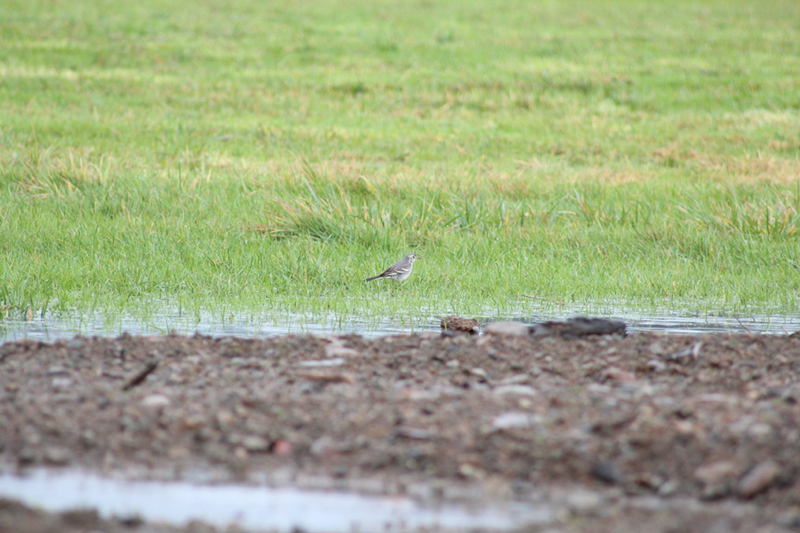 You are now looking at the field the Citrine Wagtail has been favouring. Scan for the bird around the edge of the field. When I saw the bird on November 18th, it spent almost all of its time in the southwest corner of the field, but it has also been reported by the burn piles further along the farm lane. 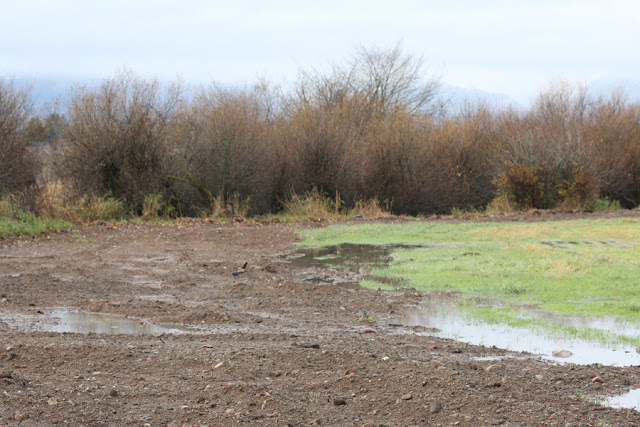 The wagtail seems to like working the perimeter of pools formed by depressions around the edge of the field. See the embedded Google map (you'll probably need to zoom out) for some extra notes and a better visual on where the wagtail has been viewed since November 14th. To maximize your chance of success, get to the site as early as possible. The bird has been seen every morning for the last week, but afternoon crowds have dipped on more than one occasion. This is an example of the Citrine Wagtail foraging along the edge of a pool on November 18, 2012. 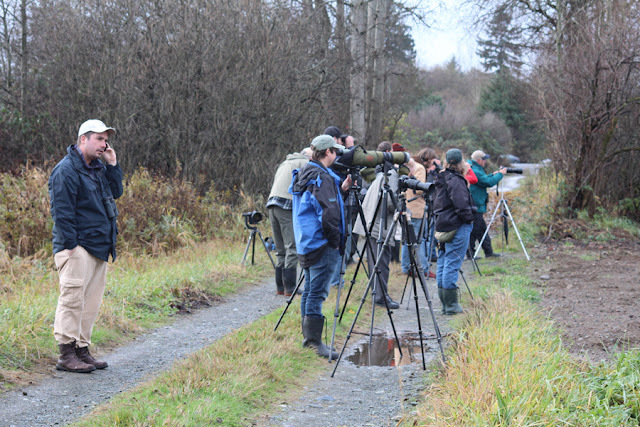 In this shot, you can see everyone is just past the patch of trees and they are scoping into the southwest corner where the wagtail was located. This is a view of the southwest corner. Note the pools forming at the interface between soil and grass and also look at the thin strip of soil wrapping around the back of the field (in front of the willows). Scan near the edge of all standing water in the field and also use a scope to follow that strip of soil around the back of the field. One final important note relates to ownership of the land where the Citrine Wagtail is located. Art Martell managed to contact the farmer that owns the land and he graciously granted birders access to the gravel road. Without Art's effort we probably wouldn't have access to view the wagtail and the chances of seeing it from Comox Rd. are next to nil. I would sincerely like to thank Art for smooth-talking the landowner to allow birders to venture down the gravel road and seek out this mega rarity. Please respect the landowner's wishes and stick to the gravel road. Thanks for your work on this. Your previous blog was a big help for us coming over from Vancouver. Great directions Jeremy - I think you could add Harbour Air as an option with an early flight from downtown Vancouver to Comox Harbour (gets in at 8:25 am) - of course this would only be convenient if you got in late and were overnighting in downtown Vancouver or lived in lower mainland and wanted to get over fast without driving. Looks like you can arrange a car rental to meet you at the Harbour Air terminal.